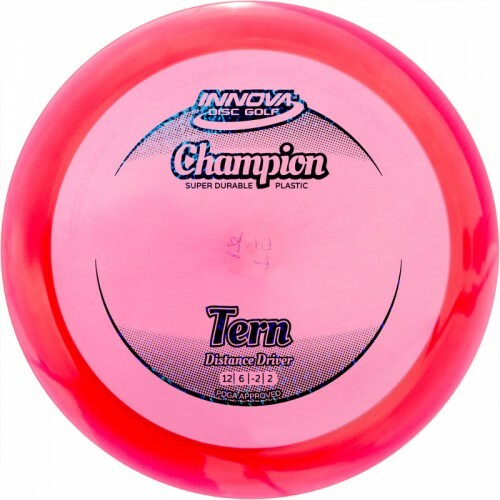 The Innova Champion Tern is a stable distance driver. The Tern has excellent speed and a flight path that maximizes glide over the entire flight. Similar to the Archon, the Tern designed for long shaping throws. In the hands of a powerful player, it just may be one of the farthest flying discs due to the long glide and natural turn. This disc golf driver is ideal for players looking to get distance from a controlled slight turning driver with ample glide. A power thrower can throw it on a hyzer line, let it flip, glide and hook back up at the end of the flight for serious distance. Overpowering this disc is not necessary.